FIGURE 3 ■ Port placement. Source: From Ref. 16. FIGURE2 ■ Patient positioning. Source: From Ref. 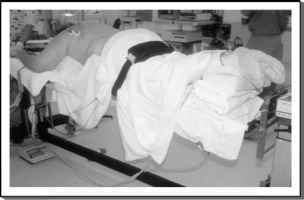 16.
retraction, creation of pneumothorax, or CO2 insufflation is not necessary because the ipsilateral lung falls out of view spontaneously due to lung deflation and the prone position of the patient.